A world peace movement that began in Abu Dhabi — what now for the declaration? Dubai: Papal visits swirl past in a haze of exchanged beatitudes and photo-ops, but Monday’s signing of the Declaration of Human Fraternity at the Founder’s Memorial in Abu Dhabi will long stand apart for its significance. 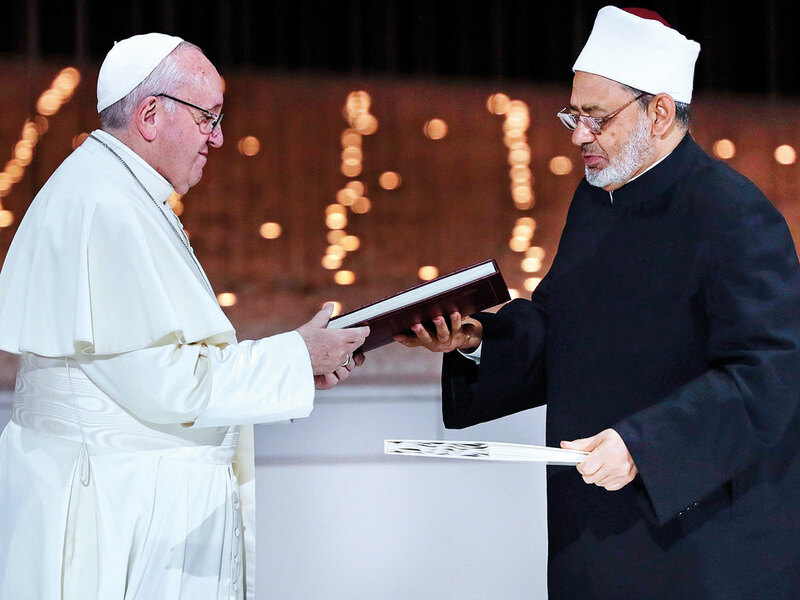 According to Pope Francis himself, the document was verified by the Second Vatican Council that acknowledged Islam only in 1965. The historic 12-point pledge of peaceful coexistence speaks in the name of “all victims of wars, persecution and injustice” in order to avoid “a Third World war being fought piecemeal,” the document stated. The document — a message for our time — to be circulated internationally among the world’s highest powers, said it will become an “object of research and reflection in all schools, universities and institutes of formation, in helping to educate new generations to bring goodness and peace to others. “On the basis of our religious and moral responsibility, and through this document, we call upon ourselves, upon the leaders of the world as well as the architects of international policy and world economy, to work strenuously to spread the culture of tolerance and of living together in peace,” the document added. Its highlights, as “a guide for future generations” to advance a “culture of mutual respect” were the imploring of all nations to allow freedom of worship, the denouncement of extremism, and the non-politicising of faith, while protecting the equal rights of women, children and the elderly, to ensure a better future. “Either we build the future together or there will be no future,” warned Pope Francis at the at the Founder’s Memorial on Monday evening. “The time has come when religions should more actively exert themselves, with courage and audacity, and without pretence, to help the human family deepen the capacity for reconciliation, the vision of hope and the concrete paths of peace,” he said on the second day of his three-day trip — the first of its kind by a pontiff to the Arabian Peninsula — which wrapped up on Tuesday. It was significant, not only because of who was saying it, the head of an institution that up until 54 years didn’t even recognise Islam — but also, where he was saying it, and who he was standing alongside when he said it. Dr Ahmad Al Tayyeb, the Grand Mufti of Al Azhar, the highest authority in Sunni Islam, can speak for both sides amid the world’s current complexities, not only on the false interpretation of faith by dark forces, but also the impact its wrongful demonisation has had on this region since the 9/11 terrorism attacks. “Western media exploited the incident to show Islam negatively as a blood thirsty religion, and to show Muslims as savage barbarians who pose a danger and threat to modern societies,” he said in a speech at the memorial. In the presence of His Highness Shaikh Mohammad Bin Rashid Al Maktoum, Vice-President and Prime Minister of the UAE and Ruler of Dubai, and His Highness Shaikh Mohammad Bin Zayed Al Nahyan, Abu Dhabi Crown Prince and Deputy Supreme Commander of the UAE Armed Forces, this was a powerful condemnation. The sort that puts the UAE at the forefront of a mission for greater unity and understanding, even while conflict rages on in the region. “We are delighted that it is signed in the UAE, the heaven of peace, interfaith-tolerance and human fraternity,” Shaikh Mohammad Bin Rashid said of the document.